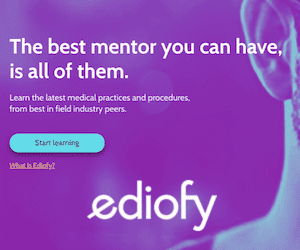 Innovator in the treatment of coronary thrombosis patients. He recommended arm-chair recuperation within the first few days following an attack, instead of traditional bed rest. An early advocate for the use of the ‘mechanical-electro-cardiograph’ to study heart patients, but he impressed upon his students the value of simple bedside methods of examination. He believed a physician should use the cardiogram to supplement his stethoscope. 1914 – Undertook internship at the Peter Bent Brigham Hospital, and a fellowship at the Rockefeller Institute. 1917 – Volunteered to join the British medical corps during World War 1. Levine was assigned to the British Heart Hospital, Colchester, where he worked under renowned cardiologists: Sir Clifford Allbutt, Sir William Osler, Sir James McKenzie, and Sir Thomas Lewis. 1921 – Advised the diagnosis of poliomyelitis for the paralytic illness of future President Franklin D. Roosevelt. 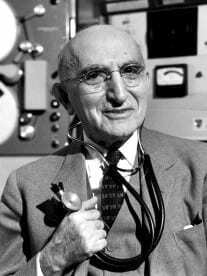 1921 – Started a summer postgraduate cardiology course, which ran for 36 years at Harvard Medical School – the longest running course at the University. 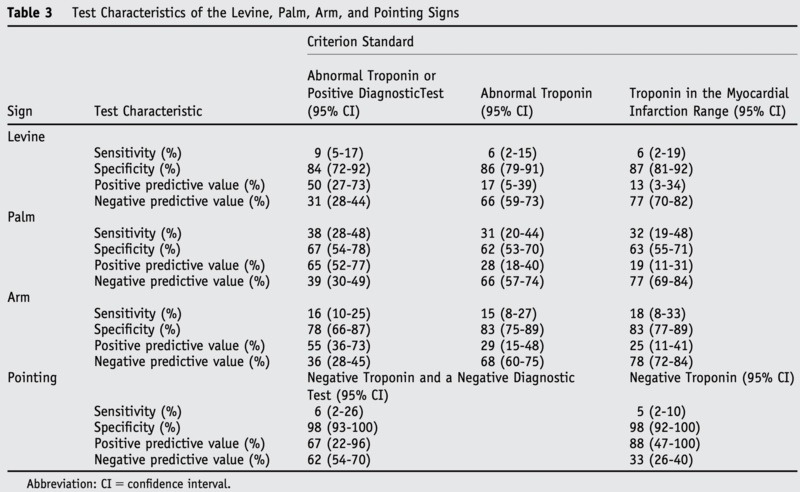 Dr SA Levine taught that a ‘clenching the fist over the chest whilst describing pain’ increased the potential that the pain was ischaemic in nature (84% sensitive but 9% specific for ischaemic heart disease; Table 3). No specific published work by Levine SA, but referenced in major cardiology textbooks to acknowledge the bedside teachings of Levine. Original source of term still being sought. Levine SA, Tranter CL. Infarction of the heart simulating acute surgical abdominal conditions. American Journal Of The Medical Sciences. 1918;155:57-65. Levine SA, Ladd WS. Pernicious anemia: A clinical study of one hundred and fifty consecutive cases with special reference to gastric anacidity. Johns Hopkins Hospital Bulletin. 1921;32(366):254-286. Levine SA: Coronary Thrombosis: Its Various Clinical Features. Williams and Wilkins, Baltimore. 1929. Levine SA, Lown B. “Armchair” treatment of acute coronary thrombosis. J Am Med Assoc. 1952 Apr 19;148(16):1365-9. [PMID 14907380]. Levine RI. Levine Sign. 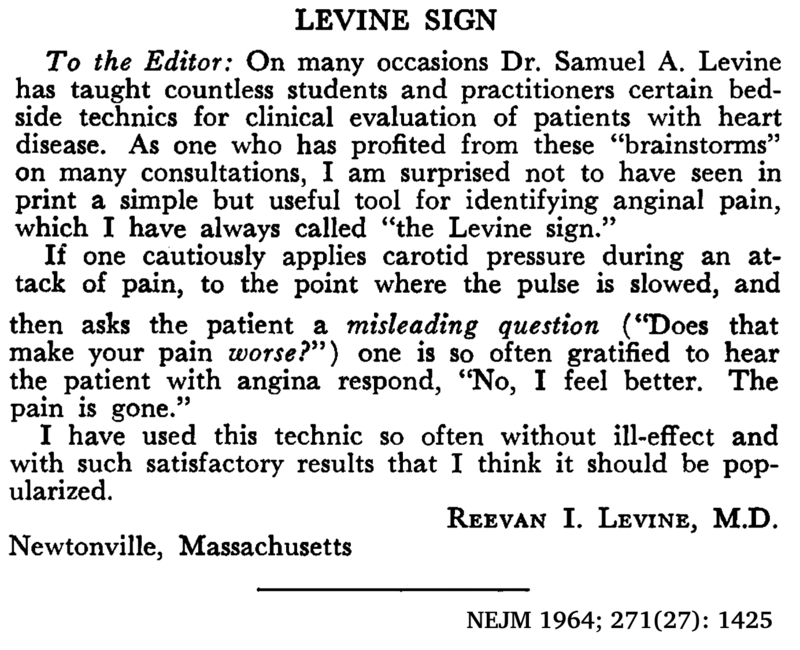 New England Journal of Medicine, 1964; 271(27): 1425–1425.